In January 2018, I joined a team of researchers at the London School of Economics (LSE) who were starting to work on a project about the local-level impact of Britain’s departure from the European Union in five British local authorities. We set ourselves a double challenge: firstly, we wanted to understand why people voted the way they did in those five areas in the 2016 EU referendum, in light of the local context and the issues that were considered politically significant locally. Secondly, we wanted to do a little experiment: If we produced a report about the impacts of Brexit that was locally relevant, combining the results of existing quantitative studies with the evidence collected through our own field work in each local authority, would it be possible to bring Leavers and Remainers together in one room and spark a forward-looking, evidence-based discussion about Brexit within each local community? Mansfield is a town of about 100,000 inhabitants in Nottinghamshire. 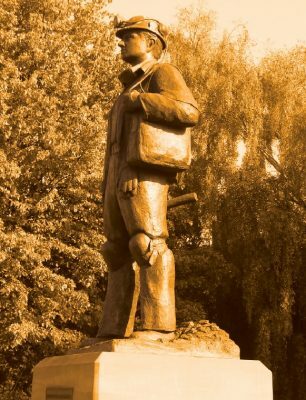 For most of the twentieth century, Mansfield was one of the major and most productive centres of coal mining in the region. However, in the late 1980s and 1990s most of the pits in Mansfield and the surrounding area closed down, while other traditional sectors, such as textiles and engineering, also faced a steep decline. Ever since, Mansfield has been undergoing a painful process of industrial restructuring, and has experienced a significant increase in low value-added, low-paid service sector employment. In the social mobility index compiled by the British government’s Social Mobility Commission, Mansfield and two of its neighbouring local authorities occupy three of the ten bottom places of the index, ranked 315, 317 and 323 respectively. These developments contribute in a powerful way to a sense of being left behind by the UK’s current economic model, which heavily relies on linkages with global markets. Due to the restrictions that are likely to be placed on the free movement of labour, leaving the EU will probably deal a blow to businesses that employ large numbers of low-paid agency workers, some of whom are immigrants. However, this does not mean that the activities of these businesses will be automatically replaced with better-paid and more satisfactory jobs for the local population. 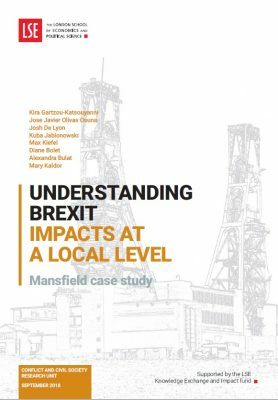 On the contrary, Brexit in itself will solve none of the underlying structural problems of Mansfield’s economy, and may actually exacerbate some of the challenges that high value-added firms face in the area, especially by reducing their ability to find skilled workers. Moreover, the EU currently provides a core part of the funding for regional development policies in the Mansfield area, subsidising precisely the types of activities that can promote development along a higher value-added path, such as training and start-up support programmes. As a net contributor to the EU budget, the UK will in theory have the means to replace those programmes, but in practice, the British government’s historical reluctance to fund stable, long-term regional development programmes with a strong role for local stakeholders in the planning and implementation stages, creates reasons for concern. Our interviews also reveal that even the most convinced Leavers do not expect that trade with the EU will actually decline after Brexit – the rationale that ‘people in Europe need us as much as we need them’ is deeply ingrained in people’s minds. A sudden increase in trade barriers therefore has the potential to inflict serious unexpected damage on the local economy, especially if it hurts strategically important sectors, such as high-end business services. Finally, the rise in inflation that has resulted from the devaluation of the pound, the increasingly acute staff shortages that the care sector has faced since the 2016 referendum, and the rise in food prices that may follow Britain’s withdrawal from the Common Agricultural Policy, all have the potential to hurt disproportionately the most vulnerable members of the Mansfield community. A few weeks ago we returned to Mansfield in order to discuss these findings with local stakeholders. We invited in a meeting about 15 representatives of local businesses and charities, civil servants, local politicians and journalists, circulated our case study report, and sparked a discussion about the likely impacts of Brexit in Mansfield, encouraging participants to make recommendations about how the town should make the most out of the situation. This meeting was one of the most inspiring moments I have had in my short life as an academic. What was remarkable was that even though Brexit has become a signature issue in the UK, the participants in our meeting did not shield themselves behind their entrenched identities as Leavers or Remainers, but made suggestions that were forward-looking and constructive. It was agreed that the debate on immigration is a red herring: the real challenge in Mansfield to recover from the experience of deindustrialization and to create good jobs that people would be proud to do. As we listened to business representatives exchanging ideas with training providers about the future steps they can take towards that direction together, and to EU funding beneficiaries explaining to local politicians how a beneficial local development policy for Mansfield should look like, we left wondering whether, by bringing people together to have a grounded discussion about a topic that is usually considered to be a minefield, we may not have made a small difference. This entry was posted in Brexit, EU ref, Europe, Euroscepticism, Nationalism, United Kingdom and tagged Brexit, EU referendum, governance, local economy, Mansfield, migration, Research. Bookmark the permalink.